Sylvia and Dave are expecting their first child. They’re excited but nervous about the upcoming changes to their life. They’re focused on the pregnancy and impending birth, but want to start preparing for what comes next. Transcript: Vision 2025: What’s going to change for you and your family? On screen: Illustration of a man holding hands with a pregnant woman. Narrator: Dave and Sylvia are expecting their first child. On screen: Illustration of a baby cot. Narrator: They’ve already started planning for how their life is going to change. On screen: Illustration of a female midwife. Narrator: They need to find a midwife. On screen: Envelope with birth certificate. Narrator: Register their baby’s birth. On screen: Illustration of a woman holding a baby. Narrator: Apply for child care benefits. On screen: Illustration of a healthcare records book. Narrator: and access their baby’s health records. On screen: Illustration of bills. On screen: Illustration of a confused man with question marks. Narrator: and want to know more about what entitlements are available to them. On screen: Illustration of a laptop with a search bar. Narrator: At the moment, Dave and Sylvia access a range of different services and search websites to find all the answers they need. On screen: Illustration of a man and woman. Narrator: or phoning call centres when the answers are hard to find online. On screen: Illustration of man and woman looking at laptop. Narrator: They feel confused and frustrated by the process and they wish there was somewhere they could go to find the answers they need. Narrator: What’s going to change if you’re having a baby in 2025? 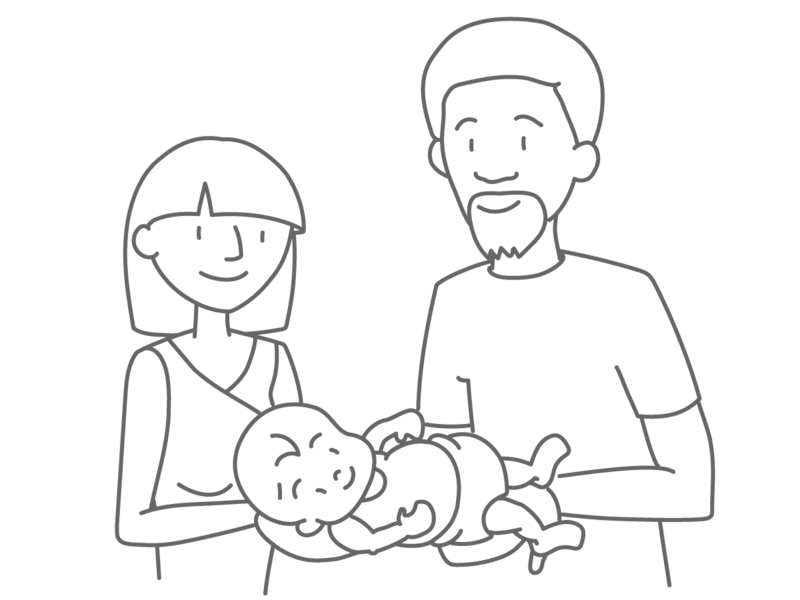 On screen: Illustration of a man and woman holding a baby next to the myGov logo. Narrator: By 2025, Sylvia and Dave will use myGov for most dealings with the government. On screen: Illustration of a leave calendar. On screen: Illustration of a birth certificate. Narrator: and how to register the birth of their baby. On screen: Illustration of a hand holding mobile phone with myGov website on screen and a notification saying “You are eligible for a payment”. On screen: Illustration of a hand holding mobile phone with myGov website on screen and illustrations of government buildings. Narrator: but also helps them determine what local, state and federal government services they might be eligible for and what requirements apply to them. On screen: Illustration of Sylvia and Dave sitting on the couch with their baby and a laptop. Narrator: Sylvia and Dave are well-informed about what they need to do and what services are to support them, so they can start planning with confidence. On screen: A woman holding a mobile phone. Narrator: When they have a query, they have the option to ask the myGov digital assistant to get the answers they need. On screen: Illustration of a baby. On screen: Illustration of a hand holding mobile phone with myGov website on screen next to government service logos. Narrator: they can provide their consent for the hospital’s proof of birth data to automatically create digital records for their child. On screen: Illustration of a woman holding a phone next to a checkbox and tick. On screen: Illustration of a woman holding a phone next to a myGovID reminder saying “Your next immunisation is due in March 2026”. Narrator: and reminders for any appointments they need to make at local health clinics. On screen: A man pushing a baby in a pram next to a woman with some trees in the background. Narrator: All these improvements will mean Sylvia and Dave are left with more time to focus on their baby. They worry about how they will manage financially once the baby is born. They don’t yet understand what kind of government services and support might be available to them. They share household and financial responsibilities and seek out information to help them make the right decision for their growing family. They need to be able to find accurate and relevant information that will help them care for their new baby. They are busy and prefer to self-manage processes and payments online where possible. Above all else, they want to provide the best care for their new baby and make sure they are not missing anything that might help them do this. In preparing for birth, Sylvia and Dave mostly look for information about government services online. However, many of these sources are written in different ways, making them inconsistent. They use Google to search for information about government childcare subsidies, but they might miss out on other relevant information. They feel unsure about what services might be available to them and where to go for more information. When their baby is born, the hospital gives them information about government services such as Medicare enrolment and My Health Record. They focus on their new baby and complete what they can, but put the rest aside for later. Over the next few weeks Sylvia and Dave look for information as they need it, through Google and information from friends and family. It’s hard for them to find the right information. They feel frustrated when they aren’t informed of upcoming events or potential entitlements. This leaves them feeling unprepared and sometimes places them in an (avoidable) negative situation. Sylvia and Dave are used to dealing with the government through a digital shopfront. They have been using the 2025 myGov for most dealings with government. They expect it to provide them all the relevant information, including how to access child care, immunisation and maternity leave rights. The 2025 myGov not only gives them the right information, but also helps them determine what services they might be eligible for and what requirements apply to them. Sylvia and Dave are well informed about what they need to do, what services there are to support them and are able to start planning with confidence. When they have a query, they simply ask the myGov digital assistant and get the answer they need. When the baby is born, they provide consent for the proof of birth data from the hospital to trigger the automatic creation of a digital identity, Medicare/Centrelink record and My Health Record for their child. They are left with more time to focus on their baby. They have already received a digital version of their new Medicare card and a notification that their new baby’s Medicare and My Health Record details are connected to their myGov accounts, with actions pending. When Sylvia logs into myGov she confirms a few details, automatically triggering a couple of payments they are eligible for. She has the digital record of parenting payments and immunisations done at the hospital. There is a reminder for the baby’s next immunisations and a link to make an appointment. Before she logs out, she notices some other relevant government information such as baby feeding advice, child care services and information on child restraint requirements where she lives. She flags these to visit later. Navigation links for What’s going to change for you and your family?